Today in Masonic History Leon Abbett passes away in 1894. Leon Abbett was an American politician. Abbett was born October 8, 1836 in Philadelphia, Pennsylvania. He attended Central High School and graduated in 1853. In 1858 he was admitted to the bar and in 1861 moved to New York City to open a legal practice. In 1862 he moved to Hoboken, New Jersey. In 1864, Abbett entered state politics and was elected as a Democrat to the New Jersey General Assembly. He served 1864 to 1866 and 1869 to 1870. In his second time in the General Assembly he was the Speaker of the House. In 1875 he was also elected to the New Jersey Senate where he served until 1877. He was the President of the Senate in 1877. 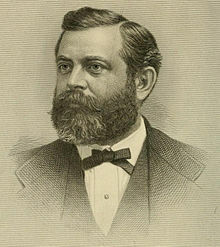 In 1883 Abbett was elected to his first of two non-consecutive terms as Governor of New Jersey, the second was in 1889. Abbett was commonly and endearingly known as the "Great Commoner." His popularity with urban lower class and the poor farm communities was extremely high. This was in large part due to the frustration of who had been demoralized by big business and concentrated wealth. He worked to voice the concerns of the common man who had been oppressed by unrestrained capitalism and special privilege. Abbett pushed through a series of laws that made him unpopular with the business community, these included wage standards, maximum work hours, and occupational and safety standards. Abbett also attempted to tax the railroad. He was eventually successful, although he paid an extremely high political cost. He would run for the Untied States Senate twice and would be defeated both times, largely due to the influence of the railroad industry. In 1893, Abbett was appointed to the New Jersey Supreme Court. Abbett passed away on December 4th, 1894 due to a sudden attack of diabetes. Abbett was a member Mystic Tie Lodge No. 272 in New York City, New York. Later he affiliated with Varick Lodge No 31 in Jersey City, New Jersey. He was also a member of Ancient Chapter No 1, New York City, New York Royal Arch Masons.